Librarians get a bad rap. In movies and on television, the librarian is the bespectacled, prudish bore, armed with a stack of tomes on birdwatching and a couple of well-timed shhhhs. Mary Beth Widhalm, MSIS ’10, breaks from that patently untrue archetype. 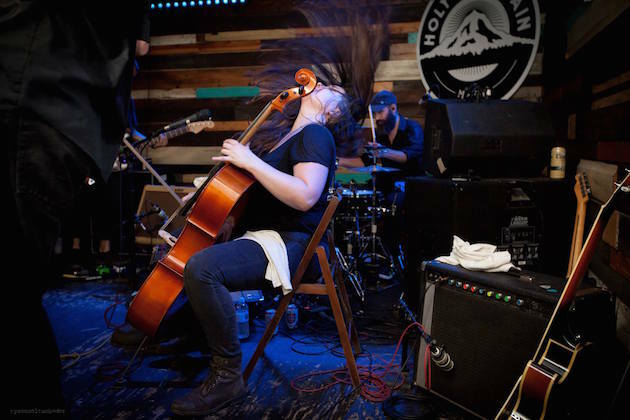 A Westlake reference librarian by day, Widhalm, moonlights as cellist in the band East Cameron Folkcore, a raucous folk-rock outfit that bucks convention in its own right. The Alcalde spoke with Widhalm about life at the library, touring Europe with a full-time job, and East Cameron Folkcore’s upcoming performance at Fun Fun Fun Fest. When were you at UT and what did you study? I went to grad school for information science from 2008-10. Were you interested in information science as a broad field of study, or did you want to work in a library? I like all things library. I did a lot of archives and museum work, but as it so happens, I found a job in a library. I work at Westbank Community Library in Westlake. It’s a public district library. A year ago I had to change my job title to go on tour more often and not be screwing over my coworkers as much. [Laughs.] I used to do a lot of programming, but it’s hard to cover story time [from the road]. I do everything else now. If the bathroom needs to be cleaned or someone needs to find a really specific article, I can help. My new title is reference librarian. You have a low-key job during the day. Do you release that energy onstage? It’s a really good balance for me. If you’ve ever seen an East Cameron Folkcore show, you know we leave it all onstage. It’s very emotional for us, and it’s nice to have that outlet to get out all frustrations. Not that being a librarian is particularly frustrating, but we have pretty crazy days sometimes. What’s a day for you like when you have work and a show? That doesn’t happen too often except I’ll have work after a show. I work on Sundays, and they are always long days. During SXSW was an extreme example of that. I went from work to shows all week long. My coworkers are all really supportive, and really cool if I have to leave early. I often lug my cello to work and bring it to practice or a show. Do people at work know you moonlight in a band? They do. My boss was just telling me in a meeting that I should never feel bad to ask off, and that they brag about me when I’m not there. Partially, I think they also want to dispel the myth of the old librarian sitting in a corner. I’m really lucky. Do your coworkers ever come see you play? Yeah, I have two coworkers, we became friends, and they are about my age. Most of the others are older and two of them have come out [to my shows] as well. That’s a big deal—that’s when they go out for the month. They say, “Let us know when you play before midnight.” That doesn’t happen very often. How do you get time away to tour? I’ve had to take three months off in last two years. We did a month in Europe this year. At a certain point you can’t take unpaid days off, so I had to go through a little red tape with that, but they are always really supportive of me leaving. Were you playing in bands while at UT? I was in a small band while in school. We didn’t play too often, and we never recorded. I joined Folkcore right at end of my schooling. Music put me through undergrad. I played classical cello for 18 years, and I got scholarships for being in orchestra. Are you excited about Fun Fun Fun Fest? I am. I have never played it before. Most of the band used to be in Bankrupt & the Borrowers, and they played in 2009. It was a really emotional show because the trumpet player [Jon Pettis] had just died, but they wanted to play anyway because it was so prestigious. I’m excited for us to get out there in our new incarnation and show ’em what we’ve been doing the last six years. We’re going into writing mode. We’ve been touring, and just had a huge CD release, so it’s been go go go. We’re pulling back right now, working on new stuff. We’re hoping to tour the West Coast in the spring, before or after SXSW, and record sometime next summer or fall. East Cameron Folkcore plays the 10th-annual Fun Fun Fun Fest on Saturday, Nov. 7.